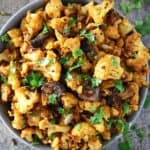 These Easy Cheesy Pumpkin Cracker Appetizers are not only super simple to make, they also happen to be simply delicious and better for me as well! 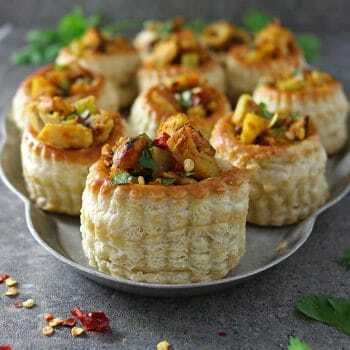 Check out the recipe below – or read on to be entertained by my ramblings. So, how was your Halloween? Did you take your kids (or your cat or dog) trick or treating? Did you dress up? Did you pack enough snacks to balance off the candy? Did you insist on “checking” most of the procured candy from the evening’s shenanigans? Back when my daughter was younger, our Halloween evenings were a blur! After work, I would rush to the daycare to pick my daughter up. We would then rush home and I’d grab something for us to snack on while she got dressed. Then, I’d make sure to pack some more better-for-us snacks to balance off the candy of the night and we’d head out! My daughter is in college now and instead of going trick or treating, we spend our Halloween evenings on the couch watching scary movies – or, should I say, she watches those scary movies with eyes wide open while I hide underneath a blanket and watch them with eyes shut tight! One thing that has stayed constant is our snacking. 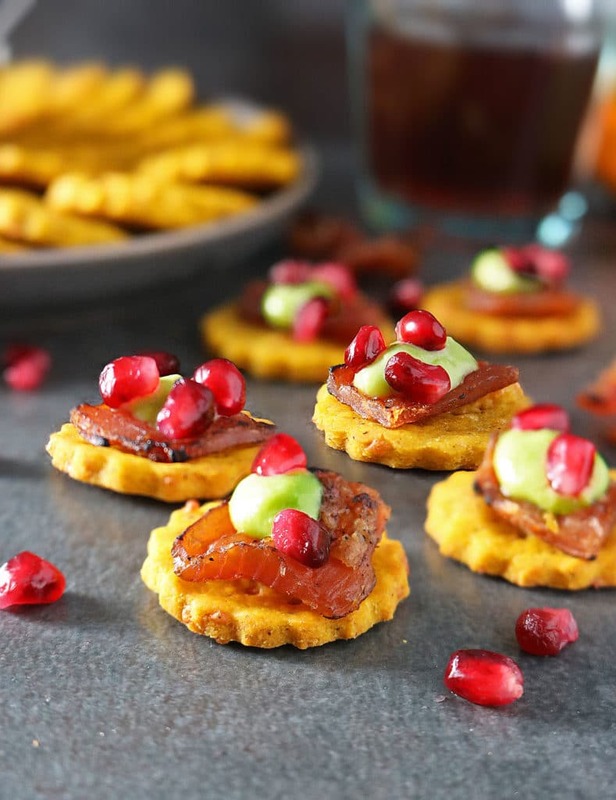 Besides, pretending to watch scary movies is hard work and better for us snacks, like these Easy Cheesy Pumpkin Cracker Appetizers, are a must – right?! 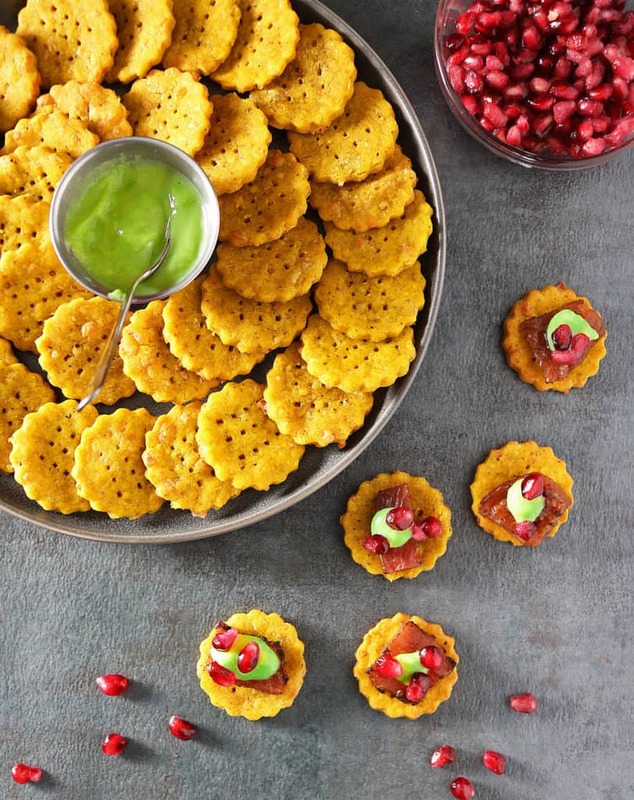 The Cheesy Pumpkin Crackers used in these little appetizers are so easy to make! Five simple ingredients and salt and pepper (all of which I picked up from Walmart while I was stocking up on Lorissa’s Kitchen products and Honest Tea® ) are all it takes! 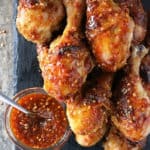 You could pair them with Lorissa’s Kitchen Ginger Teriyaki Chicken, some avocado cream, some pomegranate arils and boom! 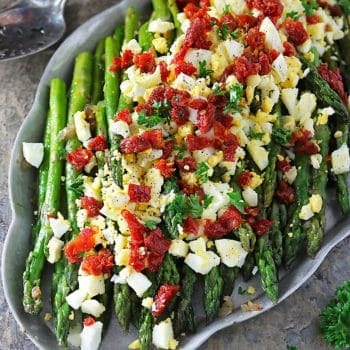 You have one good looking appetizer or better for you snack! 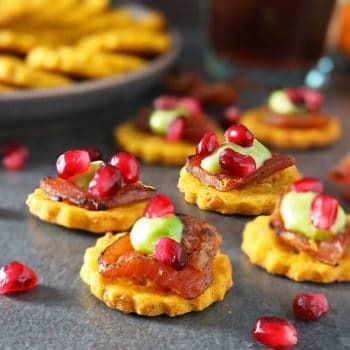 And, what’s even better is that these little better-for-you, Easy Cheesy Pumpkin Cracker Appetizers can be enjoyed anytime throughout your day! Which brings me to the topic of snacking. 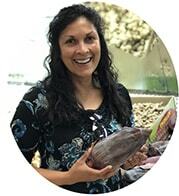 I love to snack very often (as evidenced here), and making better for me snacking choices when I cannot sit down for an afternoon meal is what keeps me energized through the day. Favorite Five Tips For Better For You Snacking Ideas To Help You Get Through Your Day! 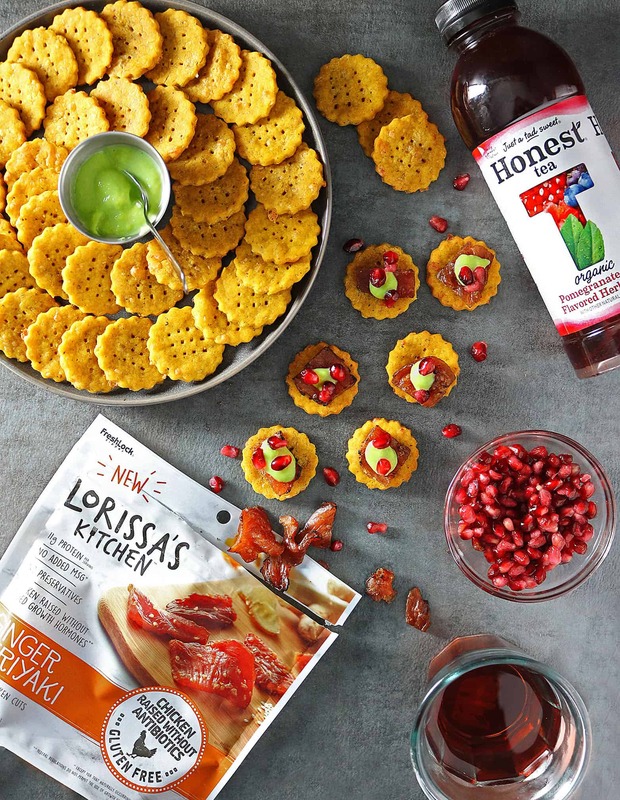 1) If you can, plan your weekly snacking just like you would plan you weekly meals – and, whip up some of your favorite snacks (like these Cheesy Pumpkin Crackers) on the weekend to last through the week. 2) Make sure your snacking choices are convenient – for example, prep your snacks or stock up on better for you snack choices such as Lorissa’s Kitchen products so you have something that’s better for you on hand when you need it. 3) Chew, chew, chew! I try to pick chewy snacks as chewing just gets my mind off the quantity of snacking and focus it on my satiety cues. 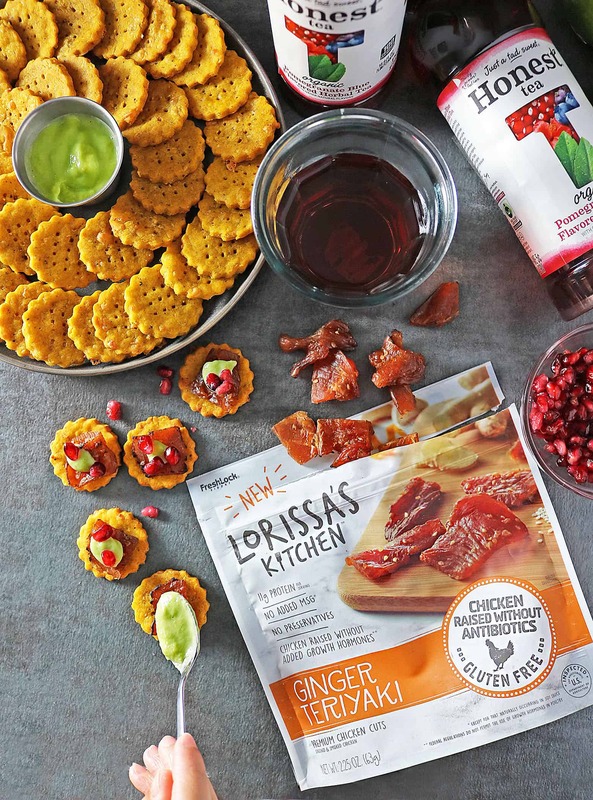 4) Snacking on a delicious combo of veggies/fruit and some sort of better for me fats/proteins always manages to kill my stomach rumbles – like these Cheesy Pumpkin Crackers and Lorissa’s Kitchen Ginger Teriyaki Chicken appetizers. 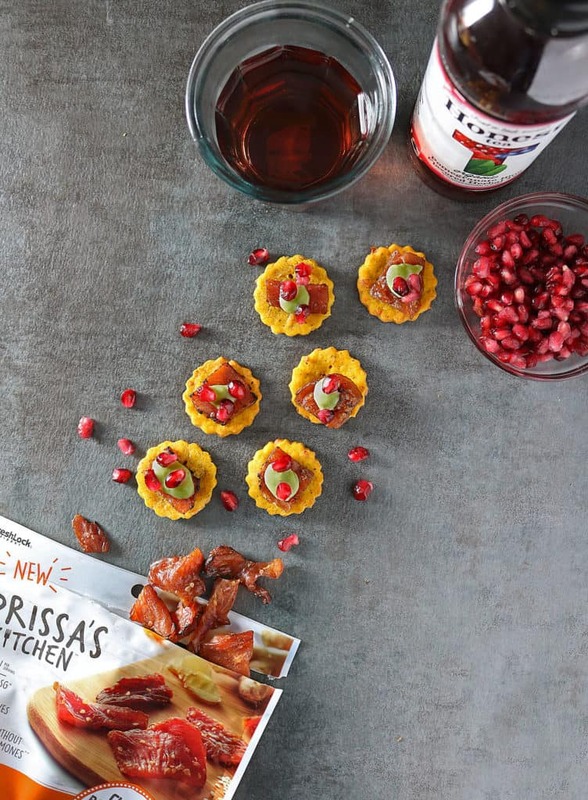 5) Try and drink some water or Honest Tea® that’s Just a Tad Sweet, with your snack of, (lets say) Cheesy Pumpkin Crackers topped with Lorissa’s Kitchen Ginger Teriyaki Chicken, some avocado cream, and some pomegranate arils! Lorissa’s Kitchen was founded on a passion for great tasting food using ingredients you can find right in your own kitchen. Their premium protein snacks are perfect for anyone living an active lifestyle that’s looking for a better-for-you, portable snack without sacrificing awesome flavor. 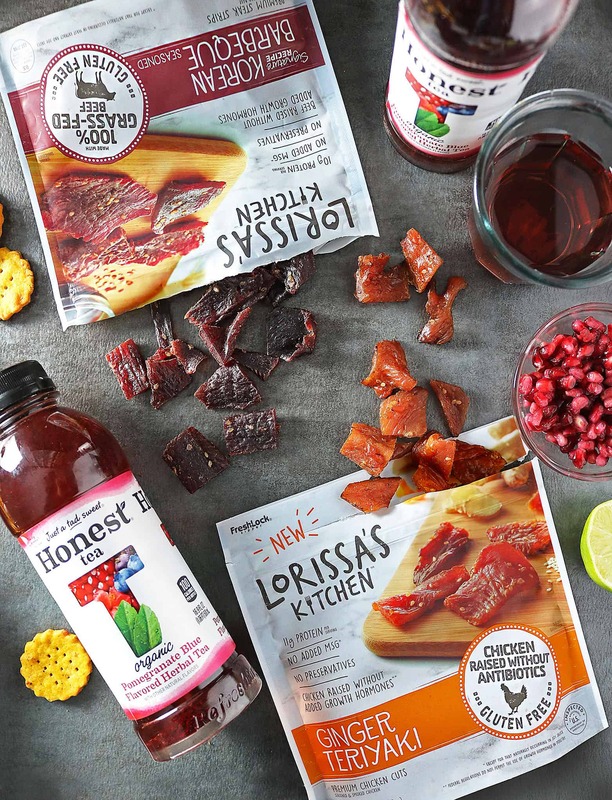 Lorissa’s Kitchen is a delicious, premium prep-free protein snack using only responsibly raised proteins, like 100% grass-fed beef, and responsibly raised pork. Lorissa’s Kitchen is high in protein, low in carbs, low in fat, has no MSG, no preservatives, no nitrates, no added growth hormones and is gluten free. Add the flour, salt, pepper, coconut oil, pumpkin puree and cheese to a bowl and mix well. Then, add in the water and roll into a ball. Using a rolling pin, lay ball on parchment paper that’s been dusted with flour and roll out till about 1/8 inch thick. Then, using a cookie cutter, cut crackers out and using a fork, make indentations in the center. Place cut out crackers on a parchment lined baking tray and bake for 15 minutes at 400 degrees. When done, take out of oven and let cool. Make avocado cream sauce by mashing avocado really well and adding enough water to make it a “cream-like” consistency. 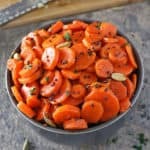 Add in salt and pepper and lime juice and use this to top the Easy Pumpkin Crackers and Lorissa’s Kitchen Ginger Teriyaki Chicken, with. Assemble appetizers by placing Lorissa's Kitchen Ginger Teriyaki Chicken on a cracker, topping that with a smidge of avocado cream and pomegranate arils. We’re in the bit-of-a-blur Halloween stage! Also, our neighborhood is THE spot to come trick-or-treating, so last night was spent frantically passing out candy, running the kids around our block once, and then passing out some more! It was a lot of fun! Movies and these snacks sound great too though!! Wow those crackers look fabulous. You’d never think they are homemade! I also love the fact that they are healthy. These are definitely on my to-do list. Pinning for later, thanks! I’m GF and love the sound of these crackers! Especially with avocado cream and pomegranate – yummy! So creative. These pumpkin crackers look so delicious! I’ve never made my own crackers before, but that is going to change, do you hear me? I’m going to make your crackers and enjoy my fair share with my husband. I have to check out that teriyaki chicken too as it looks healthy and delicious! Oh Shashi!!! These are the most perfect looking homemade crackers ever! I swear, they look like they came out of a store bought pack! And they’re pumpkin seasonal too!!! Yaay! Sounds delush! You say serves 8; how many crackers does it make? I generally serve 30+ people on Thursdays and need to know how many times to multiply this recipe. Oh, and what size cookie/biscuit cutter? 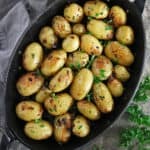 Hi Jean, this recipe makes about 40 ritz-cracker-sized crackers – these don’t store well, so you might only want to make what you need – every time I’ve made a small batch I’ve never had leftovers. Thanks for stopping by and I hope you enjoy these.